This is from sherry and bourbon casks, then married in port wood. This smell is fantastic! Much like a ruby port. Lots of chocolate, some coffee and caramel sweetness. The taste is full of dark fruits. Some chocolate again and perfectly balanced oak. The finish is so smooth. Grape sweetness pampers your mouth with a touch of the classic salt, peat and citrus. But only a hint. I love port, and this was almost like a version of a whisky port! 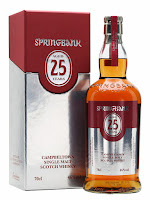 One of the best Springbanks I’ve ever had! Just to sad that the price isn’t for everyone… I will rate this 94/100 (24/23/24/23).